It’s Negroni Week! Come make this boozy summer Negroni Granita, the perfect adult icy and find out what Houston Bars are sipping for a good cause for Negroni Week! It’s Negroni Week! If you’re unfamiliar, Negroni Week is from June 4-10 and is put on by Imbibe Magazine and Campari. The idea behind Negroni Week is simple. Celebrate the Negroni cocktail in an effort to raise money for charity. With over 7,700 venues participating, Negroni Week has raised a collective total of 1.5 million. So to sum it up, some of your favorite bars have signed up to serve Negroni and Negroni adjacent style cocktails for charity. See the long list here of charities. So that means you get a chance to sip for a cause by supporting your local participating bar. Don’t worry Houston folks, I’ve got a list of bars for you down below and a link to the venue finder. So what is in a Negroni? A Negroni is equal parts Campari, gin, and sweet vermouth. You’re probably curious to what Campari taste like? Campari is considered an Italian aperitif and is an infusion of herbs and fruit that gives bitter notes of cherry and orange. When mixed with sweet vermouth and gin, you’re opened up to a punch to the taste buds. I always recommend for someone to have two Negronis…the first one is the shock and the second one is the hook. Good things need time, basically. Good thing this Negroni Granita makes enough for 4 cocktails! Since it’s Negroni Week I wanted to make a version of the Negroni that could beat these summer temperatures down into the ground. So I froze it, and froze it some more. 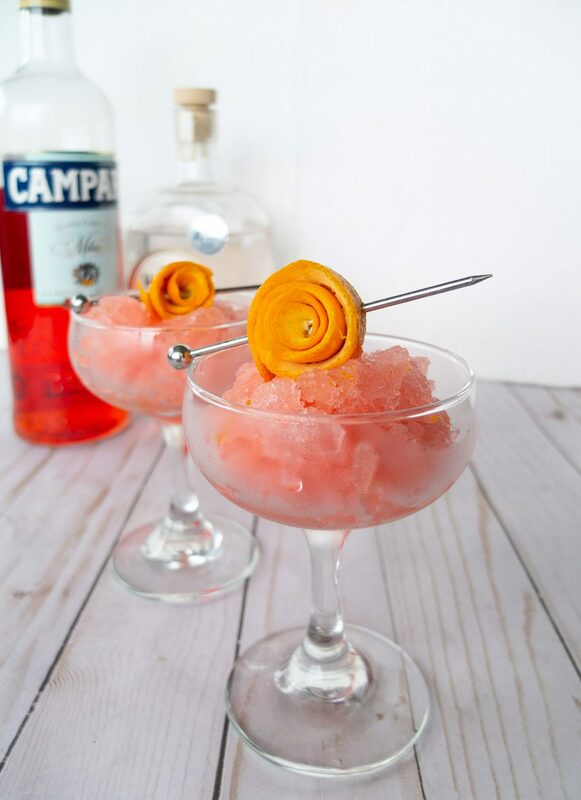 To make this Negroni Granita I used fresh orange juice and cherry juice to enhance the Campari flavors but also to get the texture you need for granita. 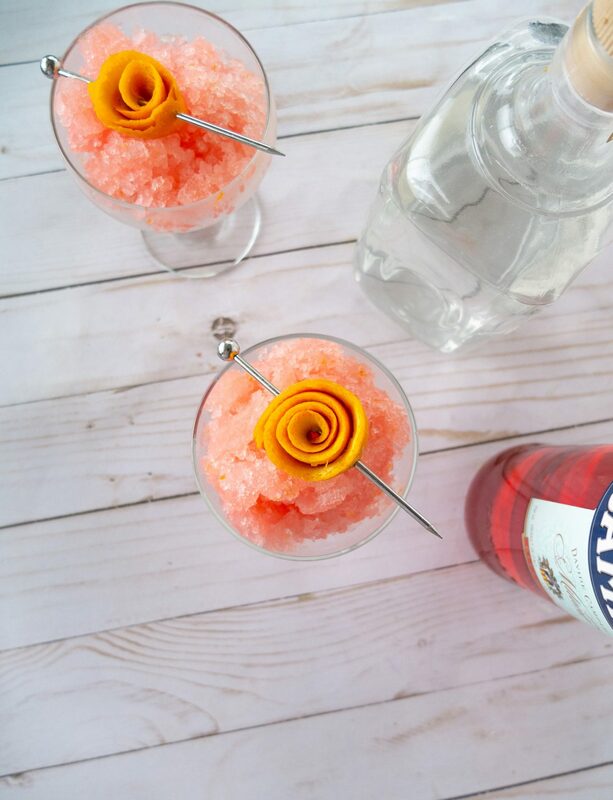 Campari, gin, and sweet vermouth frozen make more of a slushy then a crunchy ice cocktail. 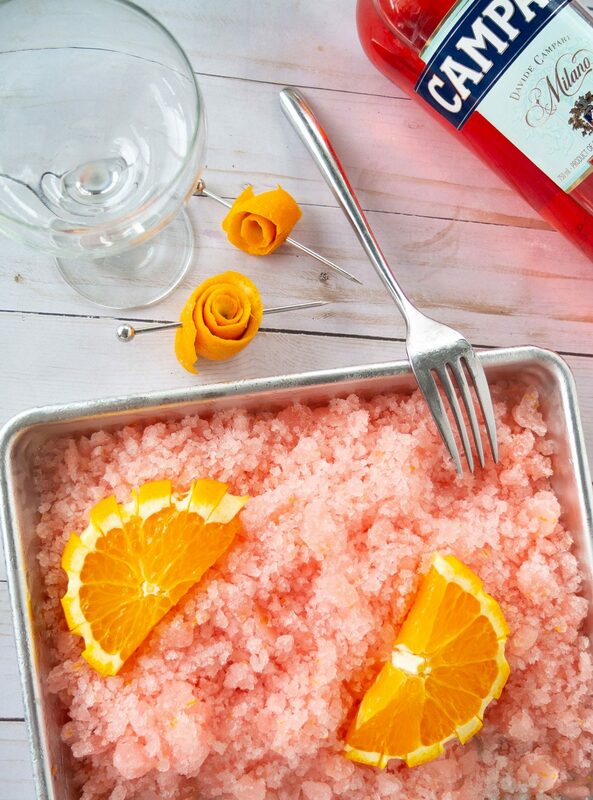 With the addition of orange zest, this granita is Negroni bitter but slightly sweet perfection. Into a large mixing bowl you’ll combine equal part Campari, gin, sweet vermouth, cherry juice, orange zest, and orange juice. You’ll add in super fine sugar and whisk until the sugar has melted down into the mixture. You’ll pour it into a shallow baking pan and let freeze for 2 hours. After it’s frozen you will take a fork and scrap it across the frozen mixture. It will begin to flake up and make frozen crystals. Once you’ve flaked up the entire pan, add it back into the freeze and repeat the cycle 2 more times. Making for a total of 6 hours. Once you have scraped it a third and final time, add to 4 coupe glasses or low balls . Garnish with a traditional orange peel and serve immediately. It's Negroni Week! Come make this boozy Negroni Granita, it's basically an adult slushy and find out what Houston Bars are sipping for a good cause for Negroni Week! 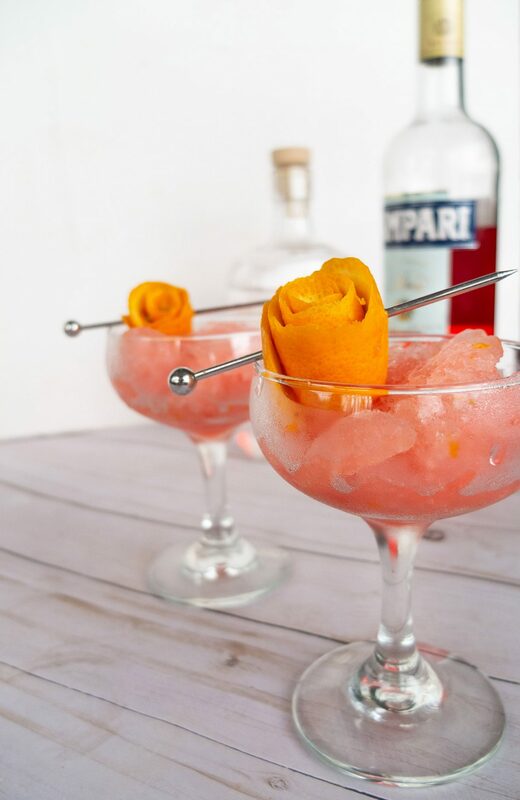 Into a mixing bowl whisk together the orange juice, cherry, juice, Campari, gin, sweet vermouth, sugar, and zest. Whisk together until sugar melts down. Add the mixture to a shallow baking pan. After scraping it for the third time, add the mixture into four coupes or 4 old fashion glasses. Serve with an orange peel garnish and serve immediately. 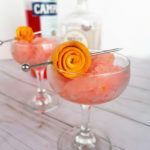 Check out more aperitif cocktails from Elle Talk! Not only is it a pretty looking cocktail it’s prefect for the 96 degree day we are having today! I love making granita in the summer and serving it when I entertain. The icy texture is always a welcomed treat and making it boozy a delightful surprise. If you are a Negroni fan, don’t worry I’ll be back later this week to share how I make a Negroni that Brad just can’t get enough of. Let’s just say it has a much needed mid-afternoon pick me up added in. Though, for this week, we will be enjoying our Negroni’s at our favorite bars to help them give back. Check out the list before and the Negroni Week venue finder so you can support your local bars looking to help a great cause. Can’t find a venue near you? Use NegroniWeek’s Venue Finder to find out a location!